brief conversation that we had about the types of books you read. pay immense returns in the future. Your writing will improve - because you will have read models of real writing. the argument or consider changing your views. broader range of points of view. you'll never have more time in your life to read than right now. dessert, as long as you don't try to live on it. to spend time finishing boring ones. caught your attention. List the arguments that you disagreed with. 3) Read this essay by my friend Zach on "How to Read a History Book,"
With a quick Internet search I'm sure you can find many suggestions. Traveling for work and can't be there for bedtime? I've found that the kids enjoy a video call on Skype a lot more than a phone call. And once we started doing the Skype calls, I figured, why not read them a bedtime story as well? As part of my determination to observe my environment more closely, I noticed this object on the wall of a building where I'm working. I've passed by these before, and always wondered what they are. It looks like a light switch, but without the switches. How are you framing the problem? The same way as your colleagues or your clients? Details count. 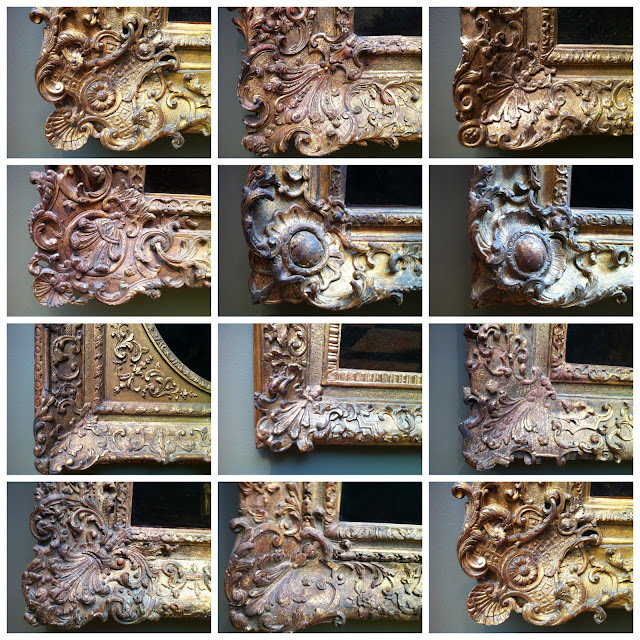 Examining the framing (or the frame) can lead to useful insights. Time spent learning the shortcuts of software one regularly uses usually has a good return on investment. But it is easy to keep using the software the way one always has, so periodically I take a few minutes to look at the shortcuts of a program I use a lot and see which ones would be handy to know. Ctrl+PgDown Switches to the next tab. Ctrl+PgUp Switches to the previous tab. Press Ctrl and click a link: Opens the link in a new tab in the background . There ought to be a way to just click on a word when I'm reading a document online and see the definition of the word. I wish someone would create such a tool. That is what I was thinking. And so I Googled it and of course someone has already created such a tool. If you use Google Chrome, you can get the dictionary extension here. Once installed, you highlight any word and then Ctrl-Click, and the definition pops up without leaving the page. Fantastic! In Paul Graham's essay "What We Look For in Founders," he mentions that one of the five characteristics that he looks for is "naughtiness" - a quality of being willing to break the rules to get something done. The question they ask applicants to explore this is "When have you hacked something to your advantage? Hacked in the sense of beating the system, not breaking into computers." This is one of the smartest application or interview questions I've seen - it is tough to game. You don't want someone who cheats or breaks the law, obviously. But you also don't want someone who can't think or talk her way around bureaucratic obstacles in the service of a higher goal. Until I saw this bag at Staples, I never thought of rubber bands as having standard sizes. Indeed, it isn't something I've ever actually thought about. You need a rubber band? You just dig through the pile of assorted rubber bands in your drawer until you find one that seems like the right size. Of course it makes sense that rubber bands have standard sizes, and of course untold numbers of purchasing clerks must be well aware of the sizes and have their minimum stock levels for their #10s, #12s, #14s, and so forth. So while this isn't news, it was a new discovery for me. And that kind of personal discovery can be just as much fun to make. Suddenly the world seems a bit more orderly. I'm walking around wondering what else is standardized without my being aware of it. A helpful chart on Wikipedia provides the length, width, and thickness of rubber band sizes from #10 to #117. In an interesting article titled "What We Look For in Founders," Paul Graham mentions a startup that Y Combinator funded called Airbnb. It looks very similar to HomeExchange.com, except with Airbnb it is free to list your property; they charge a 3% processing fee of your rental fee. I had a good experience using HomeExchange to find a place when we went to Cartagena in 2010, and I'll certainly check out Airbnb next time I travel on vacation. The site looks straightforward and easy-to-use, with lots of pictures of the properties and a well-designed interface. On a recent project, I've stayed at both a Westin and a Marriott Courtyard in the same city. Overall, the Westin is nicer (and more expensive), but I prefer breakfast at the Courtyard by a big margin. I'm interested in this because the breakfast at the Courtyard is both better and cheaper. At hotels, much of what you pay for is time savings. You pay a ridiculous amount for laundry service so you don't have to go find a dry cleaner yourself. You pay twice as much if you want valet parking. So you ought to pay more for not having to wait for breakfast, but instead you pay less. The Marriott Courtyard offers a breakfast buffet, with eggs made to order, oatmeal, waffles made to order, cereal, fruit bar, yogurt - pretty much everything you could want in a breakfast. For me, a crucial element of breakfast is speed. I want to walk in, eat immediately, and head off to where I'm going. For this, the Courtyard is perfect. At the Westin, you sit down and order, and then wait 10 minutes for a bowl of oatmeal. If I'm doing a morning breakfast meeting, then I might prefer the Westin by a slight margin. But otherwise, I'll take the buffet at the Courtyard. Here's an iPhone app I'd like to see: take the place of all the membership cards in my wallet. Then under airlines I could scroll through all the airlines where I have a frequent flier card, and an image of my card would pop up. I already stopped carrying the membership cards for airlines, hotels, and car rental long ago. I just record the frequent flier number in Outlook Contacts which syncs to my phone. But at museums and especially libraries they want to see the actual card, so I still carry some of those. I suppose I could accomplish the same deal by taking photos of the cards and attaching those photos to the contact in Outlook, but that would be a big hassle. Much better if there were an app where I could enter my membership numbers and it would pull from a website an image of my loyalty card. Even better if it can tell me how many miles I currently have. I use my iPhone camera as a way to help me observe my environment more carefully. 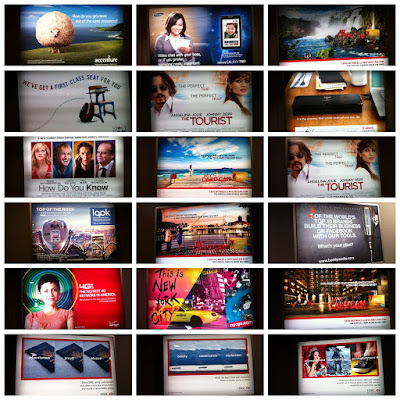 At La Guardia Airport Delta terminal earlier this month, I photographed all the billboards in the gate area. Then, looking at all the billboards together, I'm curious what the collection reveals. So, what is missing? What does this small sample tell us, if anything, about the state of the economy? Click here to see images of all 19 ads. Avoid labeling plastic bins - use transparent ones instead. No labels required. The contents announce themselves. Where else could this idea be applied? This pricing scheme at Staples turns the traditional volume discount on its head. Instead of "Buy two get one free," we have here "buy two and pay six times as much if you want a third one." I wonder if more retailers will adopt this idea - Staples is the first place I've seen it used. 1) Can we implement the XYZ idea? 2) What will it take to implement the XYZ idea? The first assumes that the answer can be "No." The second question assumes that the answer to the first one is "Yes." If you want to get something done, start asking the second question. Publicly committing to your resolution can help you keep it. Putting money on the line can help even more. One of my resolutions for 2011 is to post on this blog every day. There, I just made it public. Many people have found the stickK.com site helpful for making a public commitment. You might assume that when you file a change of address or temporary mail forwarding with the United States Postal Service that your request gets put into a database. And you would be correct. But if you think then that the system detects your mail automatically and then redirects it to your new address without human intervention, you would be very wrong. When I moved to a new place last year, a lot of my mail kept going to my old address and not getting forwarded. I had to go back to my old landlord to pick up my mail. This despite the fact that the change of address was properly recorded in the USPS computers. Your regular mail deliverer gets a notice when you file a change of address or put your mail temporarily on hold. It is then up to her to remember to set aside your mail when she is at your old address. Then she carries your mail back to the local post office, where it gets sent to the local forwarding facility, and that little yellow label gets applied with your new address. The manager explained to me that in the old days, mail deliverers used to sort all the mail for their route. They would get a bucket of mail for their route, and sort it into slots to put it in order. They could put a reminder on a slot if that person's mail was to be held or forwarded. But now, almost all the mail comes already sorted for the carrier. When they are out walking the street, they just have to remember all the people whose mail is on hold or being sent to a new address. If your regular mail carrier happens to be out sick or on vacation and a temp is delivering your mail, well, too bad. There is no system to print out a consolidated list of all the people on that route whose mail is being held or is being forwarded or where the address has changed. That is what happened to me. My regular mail carrier got the notice, but then he went on vacation and for two weeks the replacement delivered my mail to the old address. It is truly disgraceful that the USPS hasn't invested in modernizing this system. At a minimum, the system ought to print a list of all the addresses with action to be taken, so temporary workers know whose mail to pull. A much better solution would be to have the automatic sorting machinery recognize mail that should be forwarded and send it to the forwarding facility and not to the mail carrier. I moved in 2010, and didn't send out change-of-address cards, so all our holiday cards this year were delayed by a week as they went through the mail forwarding process. And a dozen or so of the cards we sent out got returned, with the mail forwarding time expired. This got me thinking again about an idea I've considered before: If we can all have our own unique personal cellphone number and email address, why can't we all have our own unique lifetime ZIP code? Then when you address an envelope, you wouldn't need to include the street address, city, and state. Just put the name (that too would be optional, really) and the 9- or 10- digit zip code. Nine digits gives you 999,999,999 addresses, which is over three times the number of people in the US. So 9 digits ought to cover it, and 10 would let you cover the entire population of the Earth. For the US version, each person would register with the USPS where mail to their zip code ought to get directed. If you move, you wouldn't need to tell your bank, your friends, and all the periodicals you subscribe to. Just tell the USPS the new place where to direct your mail. Travel tip: if you are going to be staying at the same hotel repeatedly over a period of several weeks or more, then call up the rewards department and ask them to upgrade your status. At worst they'll say no and you'll lose a few minutes. But chances are, they'll say yes. Hotels seem to be less stingy than airlines in this department. Airlines will also do a status match, but typically only once in your life, and only to match the status you already have on another airline. If you are going to stay in a hotel for 2 or 3 nights a week for, say, 10 weeks in a row, on some out-of-town project, then that hotel will probably give you gold or platinum status, or whatever they call it. What does that get you? Usually some combination of: room upgrades, extra points, and free gifts. Might as well take advantage of it. The question isn't whether your hard drive will fail, but when. So if you aren't already making regular backups of your data, today is as good a day as any to start. I use a belt and suspenders approach to backing up my data. At home I keep a 1 TB external hard drive that I connect to my laptop, and I do a complete backup of all contents on my laptop's hard drive. I also have a separate 1TB external hard drive just for photos and videos. Onto this hard drive I back up photos from my laptop as well as my wife's desktop. For this I use a program called SmartSync Pro, which I bought several years ago and now costs a one-time fee of $45. I'm sure there are multiple other programs out there that will do the job. I like SmartSync Pro because it is pretty easy to choose what folders I want to back up and to create a variety of backup profiles. The external disk drives have advantages and disadvantages. The advantages are no service fees once I buy the disks. Also, it would be much more convenient to access my files if my laptop fails. On the negative side, if my house burns down or I have some flooding or theft or other disaster that wipes out my laptop and external hard drives at the same time, then I'll be out of luck. So I also use an online solution. Like signing up for life insurance, it is easy to put off the set-up of data backups. It is a hassle, and no one likes to confront the possibility of dying - or losing all of your digital life. You can at least take care of one of these today with five minutes signing up with Mozy or some similar service. What are the most common questions people ask you about that? When making cocktail party small talk, one rhetorical device I've found that works well is the meta question. "What are the most common questions that people ask you when you tell them you do XYZ?" Instead of then rattling off their standard response to the question they've answered hundreds of times, this allows people to reflect on their experience - and they still answer the common questions. 1) Did you get claustrophobic? 2) What is the longest you stayed out at sea? "What is the most oddball question you've been asked about XYZ?" "What question should people be asking about XYZ?" I've read, and now I'm re-reading the fabulous Steven Johnson book Where Good Ideas Come From. I'll be posting a summary of the book in a future post, but for today I'll mention the concept of exaptation. Wiktionary defines exaptation as " The use of a biological structure or function for a purpose other than that for which it initially evolved." Innovation often works this way as well - repurposing a tool or idea. One thing I'm doing at the beginning of this new year is subscribing to some political magazines with points of view that I disagree with. How could a serious thinker argue that global warming is a hoax? How could a decent person oppose the health care bill? By taking the other side seriously, I'm hoping to identify and explore my own assumptions about the world. By reading reporting that I disagree with, I hope to sharpen my ability to spot flaws in an argument. By working to understand opposing points of view, I'm hoping to increase my own creativity. I don't expect to be convinced by the arguments, but I feel it is important that I'm open to that possibility. One of the essential apps for the iPhone for me is the Kindle app. While I'm not always carrying a book in my back pocket, I nearly always have my phone with me when I'm out. So now when I'm standing in line or have a spare moment, I can read a few pages of whatever book I'm currently interested in. One of the best features of the Kindle app is the ability to get free chapters of every (as far as I can tell) book that is available to purchase. For non-fiction books, you often get the introduction and the first chapter, and for many non-fiction books that is sufficient to get a decent sense of the book's argument. So my Kindle app is loaded with dozens and dozens of free samples. About once a month, I'll browse through a physical bookstore and just snap photos of any books that look interesting. I keep track of books mentioned in reviews or articles. Then when I have a few moments, I'll download free samples of all these books. It is smart business for Amazon, since I end up buying maybe 5-10% of these books. These are often books that I never would have read or purchased without the free sample feature. I've tried several techniques over the years to track all my own action items. I've tried using paper and pencil, and I've tried using Excel. The problem with both of those for me is access: when the next step occurs to me I might not have my pad or might not be at my computer, so then I have to try to remember the task until the next time I sit down with my notebook or my laptop. For about three months I've been using an iPhone app called Remember the Milk that has made a big improvement in my own personal productivity and largely solved this problem of tracking next steps. The app on my iPhone syncs to a web version, so I can update my task list either on my phone when I'm on the go, or with a browser when I'm at the computer. One big benefit is that as soon as I get an action item, I can very easily add it to my task list. I just pull out the phone, open the app, and type in the task. The app makes it very simple to add a due date, a tag, or a location. Once the task is recorded in RTM, I don't need to reserve mental space to remember to do it. I know that it won't slip through the cracks. 2) Ensures that the tasks that I choose to focus on are in fact the ones that need to get done. I find the "tags" feature very useful. I set up a tag for each client I serve. I've also added a tag for "Book" and for "Movie," so when I get a book or movie recommendation that I want to check out later I can quickly jot it down. I've also created a tag for "someday" so I can create a list of actions or activities that aren't urgent but I may want to get to at some point. I use a tag "catchup" for all the people that I've promised to call or set up a meeting with. You can of course apply multiple tags, so I might have one book tagged as "book" and "someday" while another one is tagged as "book" and "XMAS" if I'm planning to buy it as a present. The "location" feature can also be very helpful if you have some tasks you can only perform at a certain place. For example, you could set up locations for home, work, vacation house, storage, etc. The benefit with this is especially strong if there are some places that you rarely visit, e.g., "next time I go to storage, I want to make sure I get out the serving platters for the party." In September 2010, before starting to use Remember the Milk, I surveyed the apps available, and this one seemed the best solution for me. There may be better apps if you only want to use the app on your iPhone or iPad: I considered Things. But I wanted an app that also has a web interface, because if I am at the computer, it is easier to update and manage all the tasks with the laptop. RTM isn't perfect. I wish it were more closely based on the Getting Things Done system developed by David Allen. The key to making the application prove useful is to regularly review all of the tasks on your list and update the tool. If you add your to-dos to the list but then don't check it regularly, you'll continue to hold these tasks in mental RAM so the tool won't provide any value. If you do go with RTM, definitely upgrade to the Pro version. In the free version, you can only sync your iPhone app with the web once per day, but this seriously impedes the usefulness. Try the free version just to see if you like the interface, but upgrade to Pro if you plan to actually use the tool. A simple way to dramatically improve the effectiveness of meetings is simply to track all the next steps that get agreed to. While the suggestion may be almost comically straightforward, in my experience the next steps get recorded in only a tiny minority of meetings. Here are some suggestions to make it work. These suggestions apply whether the meeting is one-on-one or with a larger group. 1. Assign one person to keep track of all the next steps. The manager running the meeting might do this herself or she might want to delegate a scribe. The key is to ensure everyone in the meeting knows who is playing the role of recorder. 2. Record the next steps publicly. One way to do this is to write them on a flip chart so everyone can see them. Another way would be to directly enter them into a spreadsheet. If a spreadsheet is used, it could be projected on an overhead. If not, it is a good idea for the recorder to read it out so everyone agrees on what has been committed to. 4. Clarify the next step. The designated recorder should back up the manager to ensure the next step is clear. The description of what is going to get done should include a statement of what the action owner will do to follow up with others present, e.g., "[Task owner] will identify the root cause of the inventory discrepancy by next Wednesday and report back to [Manager] the correction actions taken and planned." 5. Review the list at the end of the meeting. As you've gone through the meeting, you have agreed to each next step individually. Now, as you close the meeting, review the entire list to make sure everyone is in agreement. 6. Send out the list of next steps to all relevant participants after the meeting. If the next steps were required on a white board or a flip chart in the office, and all participants will be working in that office, then this step isn't required, of course. It will be simpler to just go up to the white board or flip chart and cross the next steps off as they get done. But if people will disperse, then send out the next steps in whatever format people are most comfortable with - Excel, Word, Google spreadsheet, whatever. 7. Essential step! Prior to the next meeting, re-send the list of next steps with a reminder that they will be reviewed. Tell people to come prepared to discuss them. Then start the next meeting with a review of the next steps agreed to last time. Update the list of what has been done and what is still outstanding. If everyone knows that commitments will be recorded and reviewed, it significantly increases the chance that action will actually get taken. 8. An executive with a wide range of responsibilities can benefit greatly by ensuring that next steps get consistently tracked at all meetings she attends and then collected at a central place, possibly with the help of an assistant. For example, an owner of multiple businesses or an executive overseeing multiple departments can require that at every meeting, the list of next steps be sent to her assistant. Then the assistant can consolidate all these lists into a single tracking tool, possibly adding other columns such as the date and location of the meeting at which the next step was agreed to and the relevant department or company. Many situations call out for a very simple project management tool. An example would be a department manager with a handful of direct reports. Each of her direct reports has several projects underway. The projects aren't complex enough to require sophisticated Gantt charts. The projects are relatively independent such that there isn't a need to map out contingencies. The manager just wants a simple tool to keep track of commitments and identify projects where extra attention needs to be paid. In this sort of situation, a tool such as Microsoft Project is far too cumbersome. There is a good chance that most members of the team don't have that software installed or know how to use it. Even simple collaboration tools such as Basecamp involve more administration than is necessary. In cases like this, what often happens is that no systematic tracking gets done. The manager may meet with her staff individually or in a regular staff meeting, but a systematic review doesn't get done. Individual projects that are top-of-mind get discussed, but some important ones fall by the wayside. Commitments are made and then forgotten. Create a row for each project to be tracked. A project can be anything requiring more than one simple task to get done. Decide on the time interval at which you plan to review progress. Depending on the context, that could be anywhere from a day to a month or more. Updating even this tool and reviewing it does require some effort, so it is best not to make the time interval shorter than necessary. Two weeks tends to provide a good balance between minimizing administrative burden and ensuring timely review. The first week, ask the project owner to list out what will get done on this project over the selected time period. These actions go in the second column. At the end of the time period, ask the project owner to fill in the third and the fourth column. In the third column, indicate what actually got done during the first time period. In the fourth column, indicate what the project owner plans to do over the next time period. Every subsequent period, add two more columns, following this pattern. Don't delete old columns - they provide a useful reference of what has been committed to and done in the past. For easier viewing, old columns can be hidden in Excel by using "Freeze Panes." This simple structure has a number of benefits. Overcomes resistance: A core principle taught by David Allen in Getting Things Done is the great benefit of writing down the very next physical step we need to do to make progress on a project. Often we avoid dealing with a project because getting started seems overwhelming. Here is an Excel version of this project management tool. The tracking certainly does not have to be done in Excel - you could use paper and pencil, a whiteboard, cuneiform, whatever. It is the structure that is important: what got done, and what is going to get done.